xii+120 pages with frontispiece and diagrams. 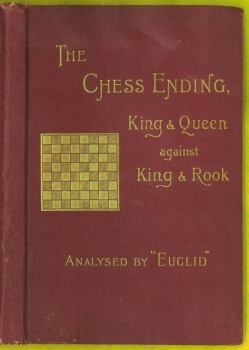 Octavo (8 1/2" x 5 3/4") issued in red cloth with decorative gilt cover of chess board and lettering. Edited by E Freeborough. Signed by Ludvig Collijn from the library of Stockholm Schacksällskap. (Betts: 22-1) 1st edition. Ludwig Collijn (1878-1939) was a Swedish author and organizer. He was President of the Swedish Chess Association from 1917 to 1939. He organized and directed the 1937 Stockholm Chess Olympiad. 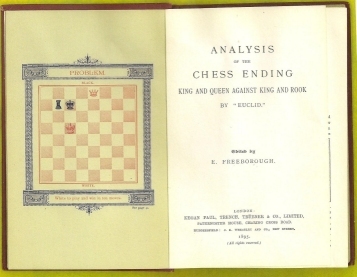 He, and his brother Gustaf, wrote Larobok i Schack, a book on openings and endings. 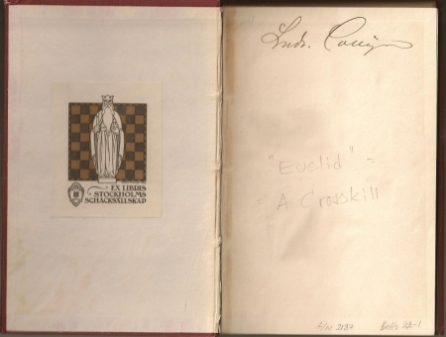 Book plate of Stockholm Schacksällskap (SSS), the oldest still existing Swedish chess club (founded 1866), on front paste down, corners gently bumped and rubbed, slight rubbing to spine ends else a very good to fine copy issued without jacket.